Born: November 20, 1826 in Dennis Ma. Where Lived: County Rd. in Pocasset Ma. Married: May 17, 1846 in Sandwich Ma. 1. John William Avery; (June 3, 1847 – August 11, 1926); Married (1) Marion Justus Davis Baker (1843 – 1883) (Justus Davis & Marion Lincoln (Swift)) in Sandwich Ma. on February 21, 1869 & married (2) Delia Welch Sherman (John Welch & Martha Edmonds) in Mattapoisett Ma. on November 27, 1884; Marion married (1) Henry W. Baker (1842 – 1866) (William Baker & Chloe Swift (Crowell)) in Falmouth Ma. on November 23, 1864; Delia married (1) (–) Sherman; John & Marion had 4 children; Marion is buried with her parents in North Falmouth Cemetery; Two of their children, Justus W. Avery & Justus D. Avery (“our darlings”) are buried in Pocasset Cemetery. 2. 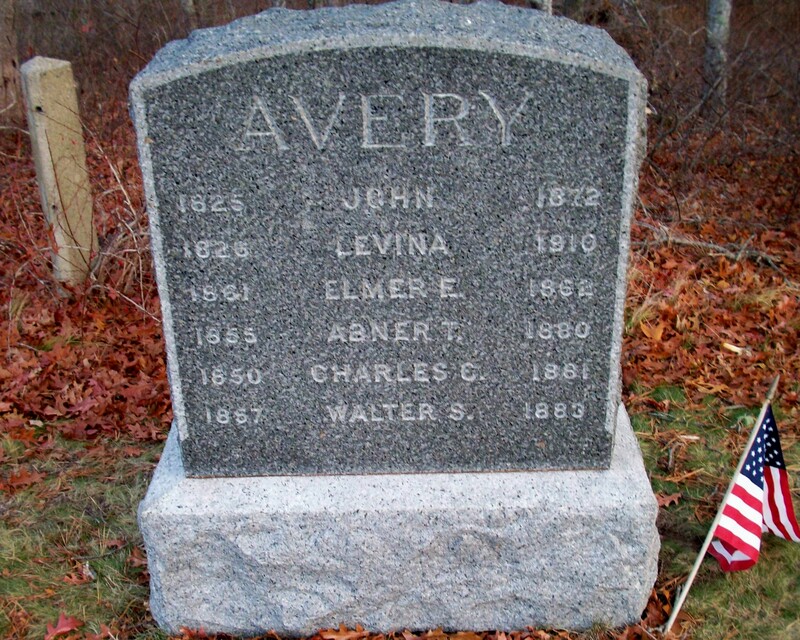 Charles C. Avery; (January 1850 – August 24, 1881); Charles was a Jeweler & died unmarried at 31 yrs, 7 mos, 3 d.; He is buried in Pocasset Cemetery. 3. George W. Avery; (December 22, 1850 – 1906); Married (1) Sarah E. Chase in 1876 & married (2) Rachel Martha Nowlin (1857 – 1900) (Robert Nowlin & Rosanna Elvira Coldwell) in Attleboro Ma. on November 8, 1889; Rachel died at 43 yrs. & is buried in Pocasset Cemetery; George died in Los Angeles Ca..
4. Warren Benson Avery; (December 21, 1852 – January 23, 1920); Married Sarah L. Turney (1855 – 1930) (David Turney & Adeline B. Davison)) in Sandwich Ma. on July 4, 1879; They had 4 children; Warren & Sarah are buried in Pocasset Cemetery. 5. Abner T. Avery; (February 6, 1855 – February 26, 1880); Married Eudora Frances Baxter (1862 – 1940) (Solomon Hamblin Baxter & Annie Mary Williston) on March 24, 1878; Abner died at 25 yrs & is buried in Pocasset Cemetery; Eudora is buried in Oak Grove Cemetery in Falmouth Ma..
6. Walter S. Avery; (February 21, 1857 – March 3, 1883); Married Frances/Fannie L. Baker (1865 – 1952) (Lewis Baker & Emily W. Mecarta) in Sandwich Ma. on February 27, 1881; They had 1 child; Frances/Fannie married (2) Frederick Howard Burgess (1865 – 1937) (Edmund C. Burgess & Betsey W. Ellis) on Abt. 1886; Walter, Frances/Fannie & Frederick are buried in Pocasset Cemetery. 7. Herbert Lincoln Avery; (February 9, 1859 – March 10, 1897); Married Ella Maria Frances Shurtleff (1861 – ?) (Joseph Thomas Shurtleff & Lucy Lavina Hathaway) in Sandwich Ma. on November 25, 1881. 8. 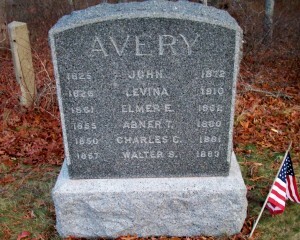 Elmer E. Avery; (June 22, 1861 – September 1, 1862); Elmer died at 1 yr, 2 mos, 2 d. & is buried in Pocasset Cemetery. 9. Elmer Ellsworth Avery; (May 17, 1863 – April 20, 1939); Married (1) Ellen/Nellie Small Wright (1867 – 1928) (Noah H. Wright & Sarah Small) in Bourne Ma. on November 25, 1885 & married (2) Ruth Ellen Bowman (1895 – 1984) (Frederic N. Bowman & Eulinda Maria Baker) in Attleboro Ma. on December 27, 1930; Elmer & Ellen/Nellie are buried in Pocasset Cemetery. 10. Harry Burnside Avery; (February 12, 1868 – January 16, 1941); Married Margaret J. Talbot (1878 – 1958) on Abt. 1897; Harry & Margaret are buried in Pocasset Cemetery.